Well good for Stephen Harper for bringing up human rights with the President of China. While the brief meeting sounds like it might’ve taken place as the two were standing next to each other in the line-up at the APEC conference buffet table, it seems the Chinese are none too pleased with the new style of diplomacy from the Canadians. After 13 years of sycophantic Liberal Prime Ministers prioritizing trade with China way above demanding action to improve human rights there’s finally a government in Ottawa which is serious about highlighting China’s brutal record with its own people. It’s kind of refreshing to know, much to the dismay of the travelling Canadian media, that no cheesy photo-ops between Harper and Hu ever materialized. Canada and China are officially at odds with each other over a noble cause: human rights. Still, many are berating Harper for threating to damage valuable trade links, and having the gall to criticize other countries for poor human rights when (yeah, you’ve heard it before) we Canadians have our own embarassing record of mistreating our aboriginal people. Well I suppose Stephen Harper will get criticized for whatever he does. Knowing China has imprisoned Husyin Celil, a Chinese-Canadian citizen, on terrorism charges, and won’t acknowledge his Canadian citizenship, Harper would be stupid not to bring up human rights with China. 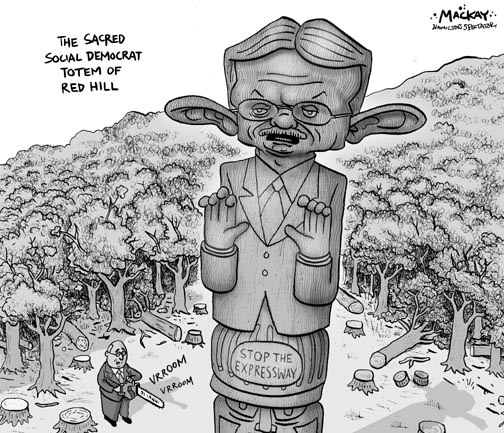 Graeme MacKay, the Hamilton Spectator ‘s sharp, funny, and sometimes mean-spirited editorial cartoonist, took one last opportunity to throw a swipe at Joanna Chapman, the private citizen who did City Council’s job for them and personally pursued charges against Mayor Larry Di Ianni for his violations of the Ontario Municipal Elections act. Turning the David-and-Goliath mythos on its head, MacKay’s November 15 cartoon shows a gleeful, witchlike Chapman brushing off her hands as she drops a slingshot and walks away from the giant feet of her slain opponent, who lies in repose with a “Re-elect Larry Di Ianni” sign resting against his shin. This closes a trilogy that started with a malevolent, scheming Chapman pushing Mayor Humpty Dumpty off the wall and continued with a sorcerous (complete with black cat) Chapman monkey hanging onto Di Ianni’s back. Again and again, we see the habit of blaming the whistleblower and sympathizing with the whistleblown. Joanna Chapman did not break or even bend the law: she enforced it. When she first raised the issue with council, they failed to do their job and launch an audit on the Mayor, preferring to close ranks around one of their own. Di Ianni denied any wrongdoing and attacked Chapman’s character until the evidence was overwhelming that Chapman was onto something, and then he switched to claiming he had made an “honest mistake”. It surprises me that some are interpreting this as a swipe against Ms. Chapman. It is indeed an exaggeration to suggest that she alone was responsible for the defeat of Larry di Ianni, but I think she deserves more credit than what has been given to her in post election commentary. As for the suggestion that I depicted her as a witch, well, that’s an interesting interpretation but I usually depict witches with brooms, pointy hats and green complexions. The cat in her bag refers to her bookstore, where I dare not enter anymore due to the number of cats laying all over the place and the fact that I have a very bad allergy to furry animals. Joanna Chapman’s very determined pursuit of an audit of the mayor’s campaign books became such a significant story of public interest that it simply begged for satirical commentary. Like any editorial cartoonist, I simply acted on my own in caricaturing Ms. Chapman. There is never any direction ordered upon me by some corporate media agenda as is often attached to anyone who works or writes for the Hamilton Spectator. Ms. Chapman was lampooned with the same degree of exaggeration and satire I would apply to any other local personality be they Russ Powers, Stan Keyes, Larry di Ianni, or David Christopherson. The accusation of misogyny is just plain absurd. She’s a tough person, and she’s British, with a good sense of how brutal British satire can be. To a few shrill complainers lacking a sense of humour and getting bent out of shape over a few tame cartoons I suggest leaning your weak kneed frames on Joanna Chapman for physical support. She knows better than to get into a big stink about harmless satire. Raise the Hammer raises it’s hammer (& sickle) again, this time in a confusing attempt to deny that it bashes the Hamilton Spectator. (Reacting to my statement at the top of this blog entry). RTH “usually criticizes the Spec’s editorial stances, not its straight reporting”, writes mouthpiece Ryan McGreal. He embraced my boss Dana Robbins and his weekend column in defence of endorsement editorials like it was some sort confession that the Spectator does indeed hold some opinions. To the Raise the Hammer folks this admission of the Spec expressing opinion is really code word for possessing an evil big money pro developer corporate AGENDA. Which is crap. But the comments beneath McGreal’s article only confirms what he tried to deny in the first place, that Raise the Hammer loves to bash the Spectator… but who really cares? I have just returned from the International Congress on Ethics. Your cartoons were a huge success. My talk was 20 minutes long. The details of the case were in the first half, and I worked that section around the 4 cartoons. When I showed the final cartoon (David & Goliath) there was a burst of applause and scattered cheers. Totally unexpected. I also got a huge amount of applause at the end. I have spoken before, and sometimes to fairly large groups of people, and never have I received that type of response. I owe this all to you, and just wanted to thank you again. Of course, it will be all downhill from here, but never mind. My understanding is that the congress organizers may be publishing a book with all the presentations. If this is the case, I will once again need your permission, because, what I said does not work without the cartoons. Of course you will probably need to see context in which I used them, but first let me know if you have any general objection. I did not congratulate you on your recent award, which was remiss. Belated CONGRATULATIONS!